i Word Lines Puzzle Game app that makes learning Russian simple and fun! Some people say that the Russian language can be hard to learn. This is not really true, learning Russian is no harder than learning other languages. 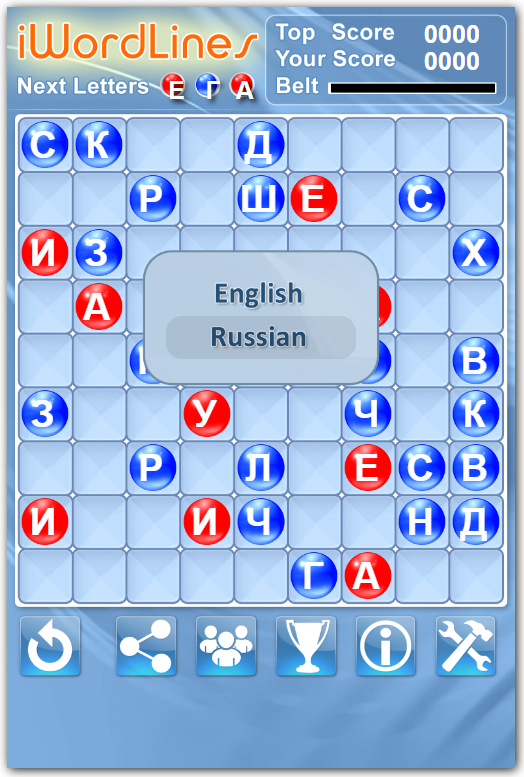 Learn Russian words and nouns in many categories with free i Word Lines Puzzle Game. It is a fun and engaging online game that helps you study Russian language and improve your vocabulary. You play FREE online or download mobile app to your Android or iPhone. Just open i Word Lines Puzzle Game app, go to “settings” and switch to “Russian” language. Game objective is to earn the highest score by combining letters to form words. Game board has 81 (9×9) cells (squares). It starts with several randomly selected letters placed on the board. Points are earned every time you remove letters from the board. The more letters you remove the more points you earn. To remove letters, arrange at least three letters to the correct word (noun) in lines (horizontal, vertical or diagonal). To move a letter, select it first by clicking on it, and then click on a destination square. You can only move a letter if a free path exists between the current location and the destination selected. With every move computer adds three new letters to the board, however new letters will not be added to the game board after a word removal. Instead, you will be rewarded with yet another move before new three letters. The game ends once the entire game board is filled up with letters. Enter in your name and see where you rank on the Leader Board – you will be highlighted in yellow.